"The truly amazing thing about Busy Bees productions is that the writing, narrating, composing, and performing are all done by the multi-talented Anna-Christina. She reads with great spirit and enthusiasm. Her voice rises and falls in time to the music and story and her British-tinged reading adds a touch of class to the affair." "The narrator has a really soothing voice, which I’m sure not just kids, but everyone will appreciate. It’s like liquid gold. Expressive and entertaining. The music background is so soothing and magical. 5 Star Rating." "These audio books are greatly original and very professionally produced. They are not just empty children’s stories. Besides being funny and well written they have a message in the story." 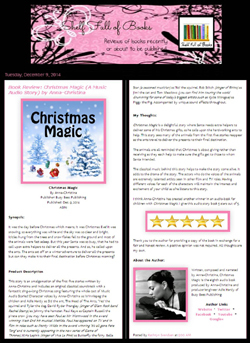 "The music is upbeat and beautifully matches the story. I loved the narrator’s expression in her story telling. The story is entertaining, imaginative and fun." "Anna's narration went perfectly with the music. Her sing-song voice and accent made a pleasing combination I think children will enjoy along with their parents. I highly recommend this book as a fun way for parents and children to interact. Loads of fun for children on the run." "What’s most striking about the album from Lilygun is how they’ve combined a real sense of catchiness with their technical approach to things, combining their signature sound with an almost mainstream like quality, something which will stand them out as more than a simple rock band. This ability, and the resulting sound is what makes this such a stand out album. If you only ever listen to one album we review, then make it this one – believe me when I say it’s worth your while!" 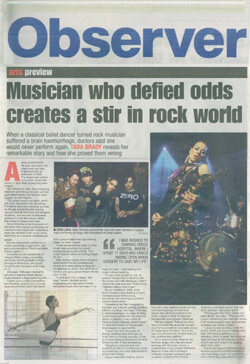 “Songwriting is nothing new to this lady as she wrote all the songs on last year's long awaited Lilygun debut album. However, she is now stepping out of her comfort zone and into uncharted waters. Anna-Christina doesn't believe in taking the easy route - most people in this situation would just play stripped down acoustic versions of their band's existing well tried songs. No - that would be too easy! Instead we get four never before heard songs and a cover. This series of solo acoustic gigs are going under the rather puzzling name of 'Pretty Little Lady?' Yes, the question mark is intentional - but why you may ask as there is surely no question? Well this little lady is puzzling so... The first song is actually called 'Pretty Little Lady? ', and once the lyrics hit home you begin to understand. This is actually hard hitting stuff lyrically and there is quite a bit of venom in there. Although anyone attending tonight wanting to hear Lilygun songs is going to be disappointed, there is one song that most people will recognise - a cover of the Garbage song 'Fix Me Now' - again showing a different side to this intriguing lady - It's not all anger and attitude after all. 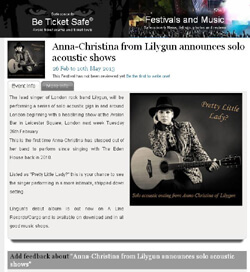 “Although she is appearing here tonight in solo acoustic mode Anna-Christina isn't your typical laid back singer/songwriter. There may be no electric guitars or drums present, but don't expect the usual nice innoffensive hippy hippy style songs about flowers and lovely summer days in the country. No - this lady has axes to grind!